Is It Time To Upgrade Your Home Security System? All You Need To Know About Smartbulbs! Are Smart Phone Apps The Next Big Thing in Mobile Apps? How smart home technology can reduce insurance Premium? With the technological surge, “smart” is the keyword that is being hunted across boundaries. If you are going to surface upon the term “smart home” it means you are soon going to enter into a world of voice-controlled devices to app-enabled gas hobs. At the most vital level, home automation products make life simpler. As a rule of thumb, not every gadget flourishes at that, but the predominant well-fabricated gadgets work out real wonders. When you just waiver your mind to think about some of the unexciting habitual chores, many things come about like a gush of wind. Especially turning off lights, adjusting the regulator, operating the thermostat, speculating the locked door are some of those routine errands which you don’t even want to think of it again. We, at Delfin, Home automation Chennai provide a solution to all your home automation needs. If all gadgets at home could connect to the internet and comply with your commands isn’t it going to be a real fantasy. When ovens, refrigerators, clocks and windows could understand your language and respond appropriately it’s not a science fiction rather it is the internet of things. Home automation in simpler terms can be stated as the capability to control almost all devices around the home with a click of a button. Yes, such fantasies have been turned into virtuosity with the help of home automation systems. For example, an analog timer is a programmed device to operate a lamp, to turn on and off at preset intervals when you are on a vacation. When you enter your home tired and exhausted, the doors get unlocked instantly and the lights get turned on with an automatic sensor doesn’t this sound exciting. 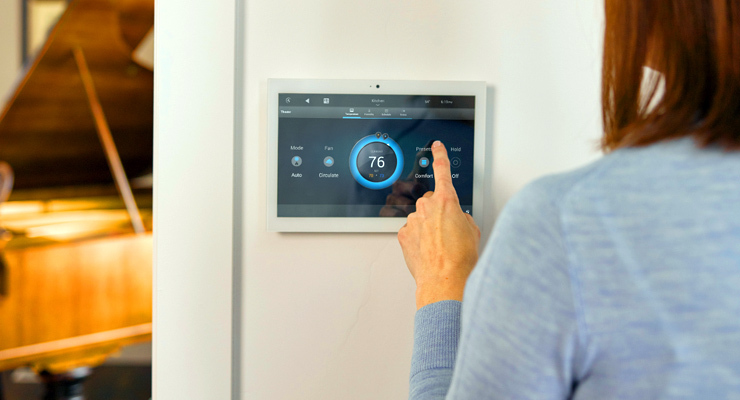 Home automation systems offer a diverse range of these sophisticated tech-savvy gadgets to streamline life. Can you imagine observing your home from a totally different place by utilizing an interface on your smartphone? All utility and security are now under the control of a click of a button. Home automation has made many science fiction fantasies and luxury homes into realities. The demand for such sophistications is also traveling mainstream owing to their immense benefits. From televisions to light bulbs everything on production undergoes a smart change. The tech-savvy owner can now continue to operate everything around the home from a distant place. To get started with home automation, the owner requires a controller which is usually a smartphone or a tablet with a centralized control panel within the home. A simple Wi-Fi or a Bluetooth connection acts a network to transmit messages from your controller to home’s gadgets. The gadgets at home must be smart features enabled to receive the messages. All gadgets innately contain Wi-Fi connectivity but in the case of lights, smart bulbs have to be purchased. Though it seems a big chore, in reality, it takes a few minutes to transform your home into a smart home if you already possess Wi-Fi at your home and a smartphone in your hand. The future of home automation looks even more promising with the growing internet of things arena. This catch phrase is going to rule the world by magnitude. The gushing trend towards embedded sensors and microchips even in the smallest of the day to day objects makes it really big for a technological boom. Such sensors enable easy access to the internet thereby making a direct connect with the owner. With the advent of such internet-mediated technology, a washing machine could communicate to your phone indicating that it’s time to shift the clothes to the dryer and similarly an oven could alert the completion of cooking. Market analysts predict the quantity of gadgets linked to the internet of things can go up by 30 billion by the year 2020. Thus, greater the number of internet-mediated devices at home, higher the chances for smart home accomplishment with the simplest home automation system. In the span of these 50 years, all-inclusive home automation systems are no longer a science fantasy or a digital curiosity rather it has become an affordable reality and accessible convenience in modern day homes. Installing a home automation system is as simple as buying things online which has enabled many people to utilize these services to make life simpler and enjoy what was once known as a luxurious life. In another 50 years, more sequels would arise to these automation systems.